Men of the Parish have a Lenten Retreat with others in our Diocese. Photo below is from the group attending last year. 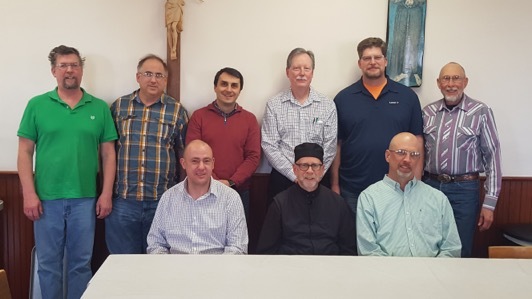 The 2019 Men's Lenten Retreat is scheduled for March 22-24, 2019. The retreat leader will be Fr. Theodore Dorrance (Director of the Office of Parish Health and Church Growth in Denver). Fr. Theodore will be speaking on "Leading a Disciplined Life". This retreat is sponsored by St. George Cathedral, Wichita, KS and is held at the Capuchin Center for Spiritual Life at Victoria, KS. There are registration forms on the bulletin board in the hall at St. Luke's. Direct any questions to Fr. Mark or Larry Lofquist. 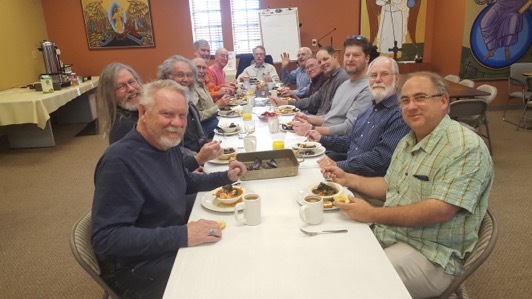 Men of St. Luke’s meet once a month on Saturdays, 9a for breakfast and study. Other Men's groups meet weekly for breakfast on Monday mornings, and Monday evening in a home for study and discussion.